Owls want to know what’s coming next, so help them to feel part of the process when adapting the potty plan for a new location or situation. Include your Owl in the preparations for the trip. “I’m going to start packing our bag for the trip to Grandma’s house. Will you please help me make sure we have everything we need to use the potty there?" Your Owl will enjoy double-checking your packing accuracy, and letting you know what’s missing. 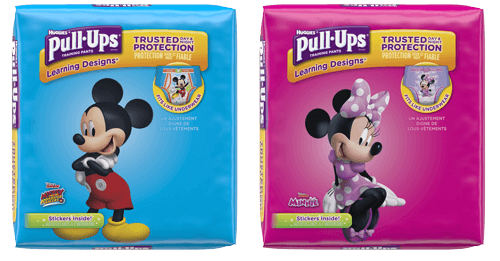 Be sure everything you use at home is in the bag, including Pull-Ups and Big Kid* Flushable Wipes. Download Owl's Out & About Checklist to help you and your Owl work together at packing your bag. When you arrive at your destination, check out the bathroom with your Owl as soon as you get there. “Does this look like our bathroom? Do you see anything new here? Wow, this bathroom has an automatic flusher … these are really cool because they flush without a handle … it’s like magic. They can be loud though, so be ready for a loud noise. I’ll show you now so you know how it works. Do you see this little circle? The toilet can see when someone stands up after they’re done using it. It makes the toilet flush all by itself. Want to wave your hand in front of the sensor to see it work? Sometimes it flushes when we just move around on the toilet and aren’t even finished yet! And it’s loud! Don’t worry or let it scare you, just remember that the toilet made a mistake and thought we were finished.” You might want to bring sticky notes to put over the sensor so that the automatic flusher won’t frighten your little Owl. When you’re on longer trips, give your child the option to wear Pull-Ups even if he’s regularly in underpants. A child who is sometimes in underwear but who will be going on a long trip will probably do best wearing Pull-Ups, particularly with the Owl personality, who may be determined to stay on schedule. Explain by saying, “Things are going to be different today and sometimes we won’t be able to get to a potty fast enough. That’s normal. It’s OK to wear Pull-Ups today.” However, a child who regularly wears undies might feel insulted by having to wear Pull-Ups again. For these children, you might bring some Pull-Ups along and have them handy just in case they’re needed during the trip.